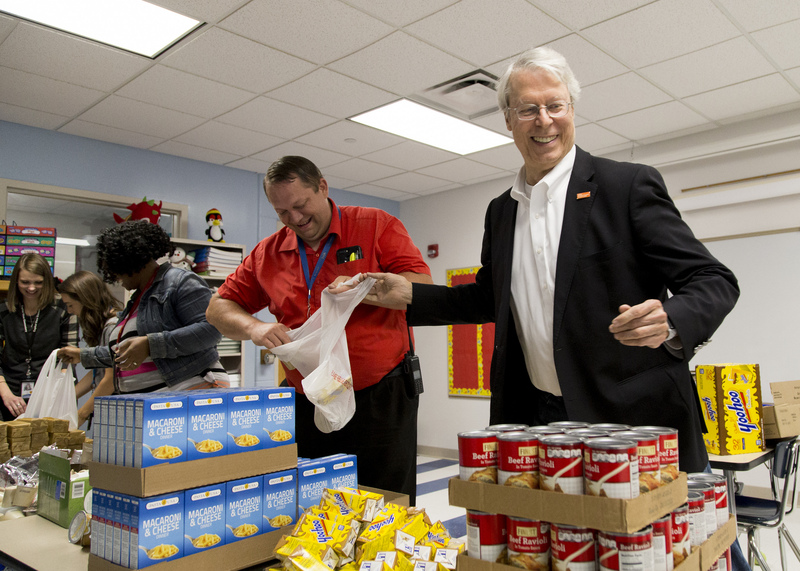 LOUISVILLE, Ky., September 28, 2018 – Mayors and government officials across the U.S. filled backpacks with food for students in their communities as a part of the fifth annual “Blessings in a Backpack Day.” More than 75 city leaders joined forces with local Blessings in a Backpack volunteers to raise awareness about childhood hunger and provide hunger-free weekends for the children who need it most. I'm proud to support Blessings in a Backpack and their mission to ensure every child has access to enough food over the weekend. The National School Lunch Program provides free or reduced lunch for 22 million children at school during the week. That program serves as a vital source of food Monday through Friday, but many students return to school on Monday hungry because they do not have access to enough food over the weekend. This is where Blessings in a Backpack steps in. This school year, Blessings in a Backpack will provide three million hunger-free weekends for more than 87,000 children in 45 states and the District of Columbia. “Blessings in a Backpack Day” is an annual opportunity for volunteers to work with local elected officials to highlight the hunger issues in their communities. Atlantic Beach, Fla. Greater Rochester, Mich. N. Redington Beach, Fla.
Austin, Texas Guntersville, Ala. Phoenix, Ariz.
Baltimore, Md. Hampton, Va. Shively, Ky.
Bethlehem, Pa. Houston, Texas St. Augustine, Fla.
Bonita Springs, Fla. Jacksonville, Fla. Stafford County, Va.
Columbia, S.C. Jacksonville Beach, Fla. Syracuse, N.Y.
Des Moines, Iowa Longwood, N.Y. Troy, N.Y.
Denver, Co. Louisville, Ky. Tucson, Ariz.
Effingham, Ill. Neptune Beach, Fla. Wabash, Ind. Ft. Wayne, Ind. New Albany, Ind. Frederick, Md. New Orleans, La. Learn more information about Blessings in a Backpack. Hunger has both short- and long-term negative effects on children’s health and ability to succeed in school. Blessings in a Backpack mobilizes communities, individuals and resources to provide food on the weekends for elementary school children across America who might otherwise go hungry. Blessings in a Backpack is providing three million hunger-free weekends for more than 87,000 children in 45 states and the District of Columbia.